An apparently new arrival in the plethora of groups promoting the virtues of print media is the News Media Association, whose website tells that it is “The voice of national, regional and local newsbrands”. We are told that “Newsbrands - national, regional and local newspapers in print and digital - are by far the biggest investors in news, accounting for more than two-thirds (69 per cent) of the total spend on news provision in the UK”. The NMA wants us to know that it has a “mission to promote the news media industry”. That sounds most uplifting. So perhaps the NMA would like to give us some examples of how they intend to pursue their mission of promotion? They most certainly would, and one of the items on their website right now discusses the Government’s green paper on the future of the BBC. Here we begin to see the true nature of the NMA. Santha Rasaiah of the NMA has said “The BBC’s increasing encroachment into areas already served by independent news media providers has been a matter of great concern to the industry for many years”. This is the same line taken by BBC bashers in the right-leaning part of the national press, and it’s fallacious. The problem for those independent news media providers is that their advertising revenue has been badly hit. The BBC, as any fule kno, does not run advertising: what is hurting - indeed, killing - many smaller providers is that their principal revenue stream is being abstracted by online advertisers. The NMA appears to be rather “Old media”, a thought that is only reinforced when its material on Press Freedom is considered. “The battle between politicians and the press in the wake of the Leveson Inquiry has abated but not disappeared”, they tell. 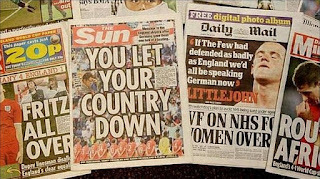 There is then a generous helping of misrepresentation: “New legislation has been passed aimed at punishing newspapers in libel and privacy cases – even if they win - if they have refused to sign up to state-backed regulation, a mixture of medieval prerogative and political control”. There will, we are told, be resistance to the Royal Charter, even to the extent of taking the whole business to Strasbourg. Why is this? Because the NMA is indeed “Old media”. A perusal of the directors’ list for the Newspaper Organisation Limited (the NMA is its trading name) confirms this in spades. Present and correct are Murdoch MacLennan of the Telegraph, Mike Darcey of News UK (the Murdochs), Simon Fox of Trinity Mirror, and Kevin Beattie of Associated Newspapers (the Mail). This is, let me put this directly, an establishment lobby group. Moreover, it has been a premeditated creation: although most of the directors’ appointments came earlier this year, the company was incorporated in March LAST YEAR. The NMA is an attempt by the press establishment to push for diminution of the BBC, while promoting IPSO as some kind of “tough” new regulator. It is therefore another incarnation of that last chance saloon where the booze never seems to run out. Except it will run out, and probably sooner than some of its inmates think. 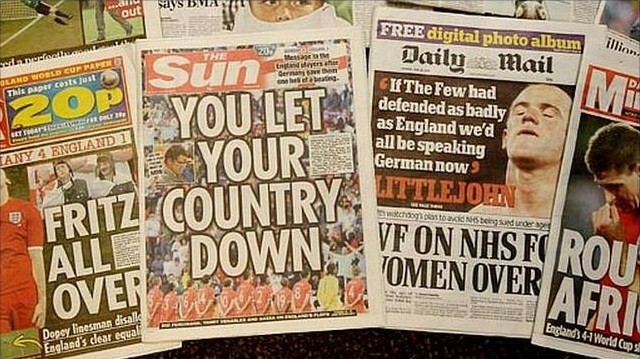 The great print media attitude - that they should be allowed to do whatever they want, and that if the world changes and they fail to keep up, it's the world's fault for changing. Tim, I hope you were struggling to keep your face straight when you wrote this bit: "...the right-leaning part of the national press..."
I say this of course because ALL of the twats are far right. Honourable individual exceptions are so few and far between they are almost an endangered species. Which is why journalists are as hated as politicians.